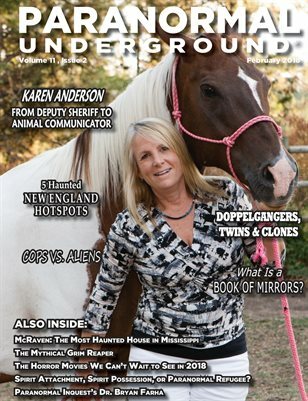 In this issue of “Paranormal Underground” magazine, we spotlight medium and animal communicator Karen Anderson, Paranormal Inquest’s Dr. Bryan Farha, paranormal mystery writer Renee George, and the top horror movies in 2018. We also cover the latest paranormal news. In our Case Files of the Unknown, we feature the haunted McRaven house, a UFO encounter involving a mini golf course owner and the local police, and the mythical Grim Reaper. And we also take a look at the correlation between doppelgangers, twins, and clones; the heart chakra; a shaman’s enlightening encounter; and five New England haunted hotspots. Also in this issue, don’t miss our coverage discussing what a “Book of Mirrors” is, a personal experience involving a “grimm,” and one investigator’s questions about spirit attachments. Plus, author Ian White asks for your help shedding light on prejudices in the paranormal world.